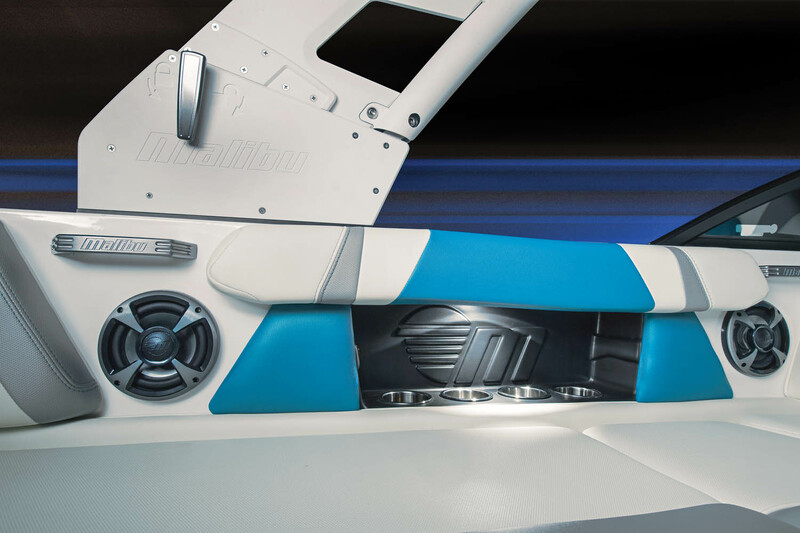 Malibu’s new 21 VLX is the boat many people wanted to own but didn’t think they could afford. Usually, ski boats from a premium brand such as Malibu come with a price tag that is more consistent with a house than a boat. But for 2017, Malibu is offering a loaded Wakesetter 21 VLX — including a trailer — for less than $80K. Game changed. 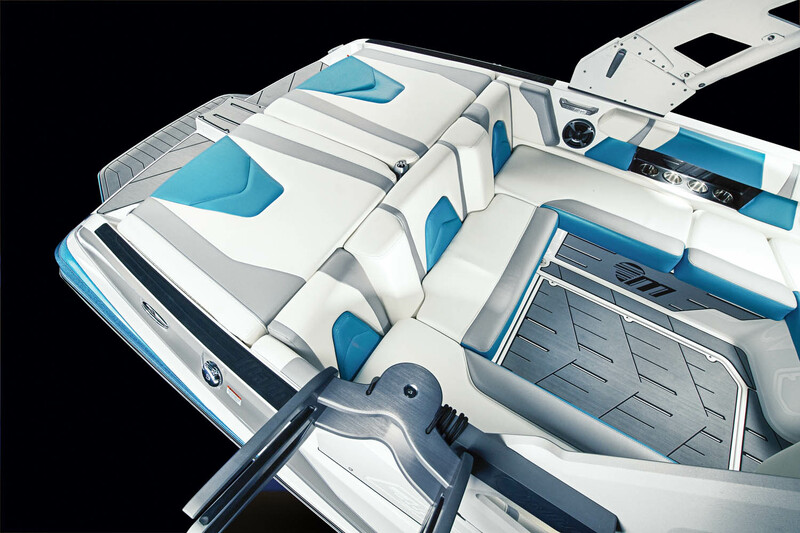 Previously, Malibu’s only “service entrance” into its family of watersports boats was via the Axis brand. First launched in 2009 as an independent arm of Malibu, Axis started with one model, the A22, which was pretty spartan. 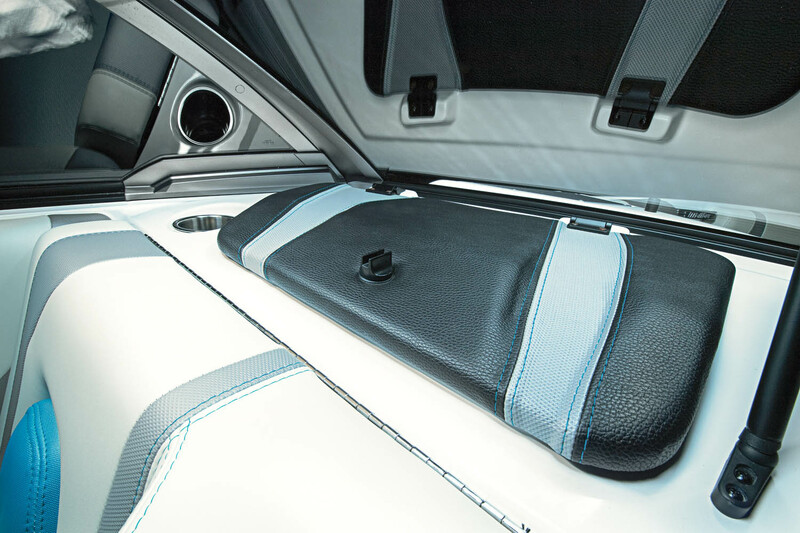 Underneath its plain-Jane upholstery it clearly showed some Malibu DNA, especially when it came to function, but many of the best Malibu goodies, such as the new-in-2009 MaliView display screen, weren’t on the table. More recent Axis models have been decidedly more upscale and offer the option of including some former Malibu-only features. But they still don’t have the Malibu name on the outside, which is a big deal for many watersports enthusiasts. Surprisingly, Malibu didn’t hit its price point by making all the most popular features options. It’s selling the 21 VLX as a turnkey boat that’s ready to go have some watery fun without checking a single box on the options menu. 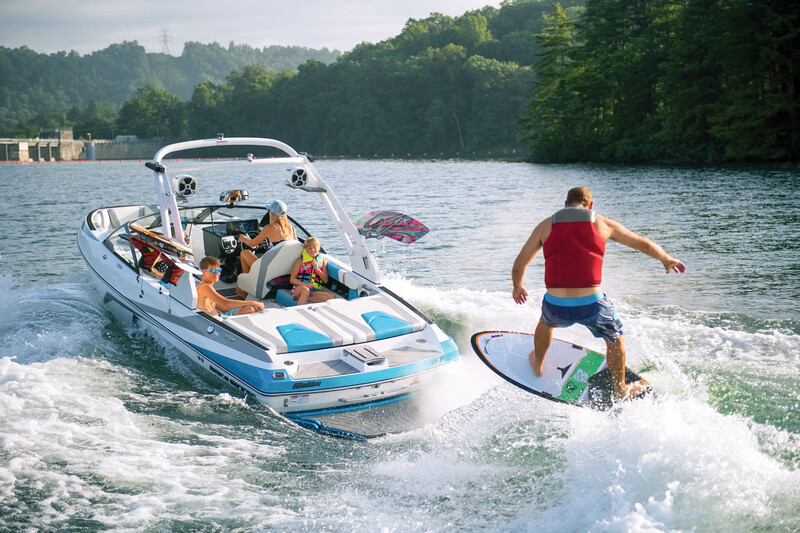 Most of the heavy lifting is done by Malibu’s Integrated Surf Platform, which provides a killer surf and wakeboard wake with features such as Surf Gate and Surf Band, Command Center, Power Wedge III system and Quad Hard Tank ballast. Also included is the G3.5 Tower, which has board racks and a Bimini for shade. Even the stereo is upscale — a six-speaker Wet Sounds Bluetooth system that includes a 12-inch subwoofer. Malibu uses the Indmar 6.2L platform for its 21 VLX, which is based on the Ford Raptor iron-block V-8 that has aluminum heads and a single overhead cam design. The standard engine is the Monsoon 410, and the number refers to its torque rating rather than its 350 hp. 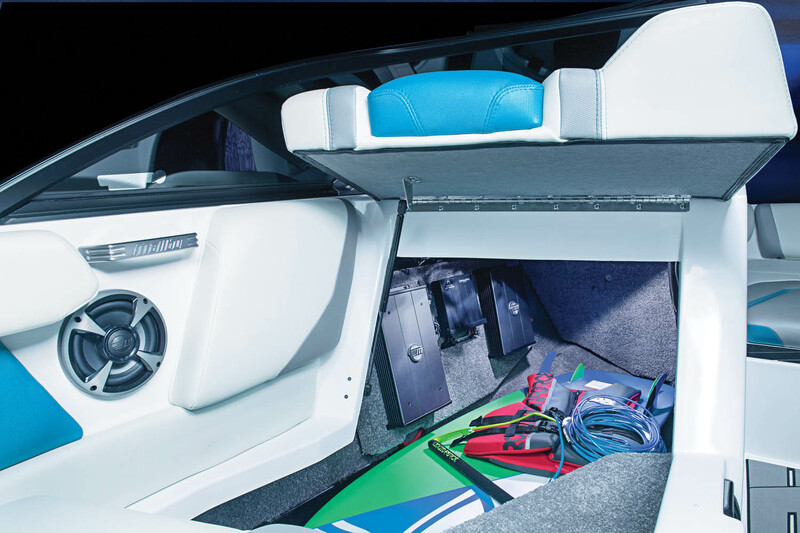 That’s not just because 410 a larger number, but because when it comes to pushing a wakesurf boat that’s loaded with nearly two tons of ballast, torque is the number that really matters. Owners will like the fact this is the same block found in the 450 (400 hp) and the Rauch-supercharged 575 (not available on the 21 VLX), so it’s probably a little overbuilt in its Clark Kent configuration, which bodes well for its longevity — not to mention the security of having Indmar’s five-year warranty. The base engine provided plenty of punch on test day, even when we had the boat loaded with ballast. The Wedge II is a standard feature that simulates 1,500 pounds of ballast while helping to shape the wave and helps the 21 VLX get on plane quicker. The Wedge II redesign gave it 21 percent more surface area over the original Power Wedge but also gave it an upturned angle that creates more lift. Without it, our test Malibu reached plane in 3.9 seconds with a fair amount of bowrise. With it deployed, the time was cut to 3.2 seconds with considerably less bowrise. A flat power curve got it to 25 mph in five seconds and pushed strong all the way to its higher-than-expected top speed of 41 mph. At 21 feet long, the 21 VLX is among the shorter models in the Malibu lineup, and it features a narrower-than-most 8-foot, 2-inch beam. Both of these specs help give it really nimble handling that’s enhanced by twin tracking skegs. Even when romping at full speed, the driver can whip it into a jetboat-like turn (after warning passengers, of course). What’s great about the Surf Gate system is you no longer need to overweight one side to get a great surf wake — a technique that makes a boat heel far over. It uses two vertical tabs to redirect the water that’s rushing around the hull. Normally on an evenly weighted boat, the flows converge in the center, but by disrupting the flow on one side when the tab sticks outward 6 inches, it creates a clean, giant surfing wake on the opposite side. Thanks to the robust hydraulic system, changeovers happen in less than two seconds and the switch is announced by a horn on the transom or by optional tower lights. The upshot is the boat stays level, which gives the driver more control. Driving a fully laden 21 VLX, with its 4,000-pound hull and ballast maxed out at 3,690 pounds, was really easy. Like most surf boats, drivers can tighten up the surf wake by carving a slight turn in the direction of the surf side, something that was no problem, nor was turning around at the end of the lake. The 21 VLX is a boat for all who love watersports, thanks to Malibu offering it with a choice of two different hulls. The Wake Plus hull we tested is designed to create the biggest, tightest wakes possible and is the clear choice for owners who are all about surfing. The second choice is the Diamond hull, which turns the 21 VLX into a crossover that does everything well. Dump the ballast, cruise to a speed greater than 31 mph and the wake flattens out admirably for slalom skiers. For the next run, add max ballast, set the standard Zero Off cruise control for 21 mph and the wakeboard ramps are surprisingly good — a bit more mellow and not as large as with the Wake Plus version, but only pros or talented amateurs might find it wanting. In surf mode, the Diamond still plows up an admirable wake. The 21 VLX is rated for 13 people, and there’s a seat for everyone on luxurious fabric-like upholstery. As mentioned, there are two engine choices for the 21 VLX: the Ford Raptor-based 6.2L Indmar Monsoon, either the 410 or the 450 (remember, these are torque numbers). The two engines are identical, except for software within the ECU that boosts the horsepower by 50. This flash of the computer’s card comes at the rather steep upcharge of $7,667. Looking at the respective power curves of each reveals not much difference below 3500 rpm in either horsepower or torque, so it looks like this is a rare case where the entry-level engine is the correct bang-for-the-buck call. Given the huge list of standards on the 21 VLX, there’s not a whole lot left to add. In fact, blowing up the bottom line would be difficult, because many popular Malibu options aren’t available, which, understandably, gives buyers an incentive to upgrade to a more expensive model. One item that would be greatly appreciated by owners that isn’t available is Surf Pipe, which sends the exhaust downward so it surfaces behind surfers. It’s not really a safety thing, since the Indmar engines are rated Four Stars by CARB, signifying they are super ultralow emissions engines, but it reduces the engine noise to the point it’s like a stereo upgrade. 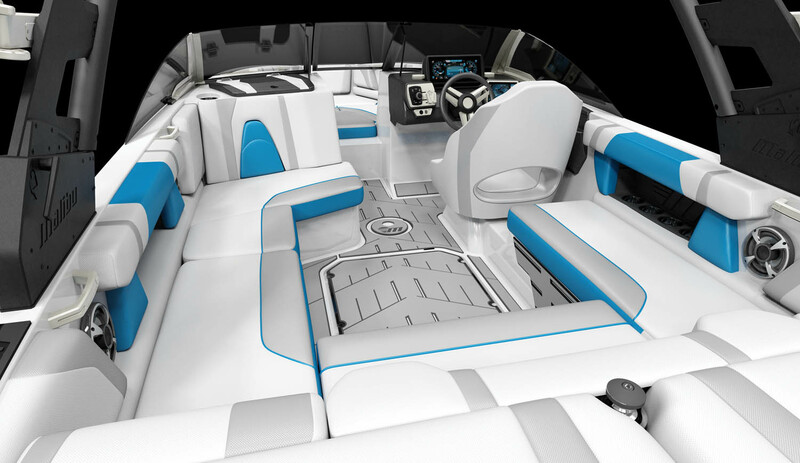 At the helm, drivers are set with everything they need, including a tilting 12-inch Touch Screen Command Screen where they can control most of the boat’s systems, including ballast presets, stereo and cruise control. It also comes with the Sport Dash with the rotary knob that allows drivers to perform functions such as switching the side of the surfing wake or bumping the speed just a little. Some of the notable options include Soft Grip flooring ($333), bow ballast ($817) and a colored deck ($700) and hull ($1,050). Add these to the standards such as snap-in carpeting, a 14-inch rearview mirror and two pairs of popup cleats, and the boat’s ready to hit the lake in style. Purchased by Bob and Nadia Riggins, plus Cullen, 9, Finley, 7, and Avery, 5, Belleview, Fla. Purchased at Transition Watersports, Ocklawaha, Fla.
A number of options weren’t available that we would have liked, such as a heater, hot shower, lighting options and Surf Pipe. We’ve owned about 10 Malibus and two Axis watersports boats and bought the 21 VLX sight unseen because we knew what to expect, and we haven’t been disappointed. 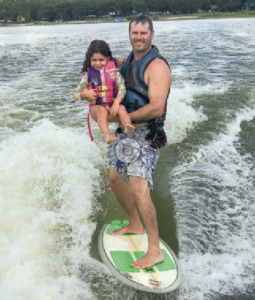 Lately, I’ve been spending most of my time on Lake Weir chauffeuring my kids, who really love watersports. All three are into wakeboarding, Cullen likes to slalom, and he and Findlay are avid wakesurfers. I’ve known Nate, who owns Transition Watersports, for 20 years and he really takes great care of us. He’s incredibly responsive and makes sure our boat doesn’t spend time sitting around the shop waiting to be repaired. LOA: 21 ft., 0 in. Beam: 8 ft., 2 in. Nice boat. Malibu has come a long way from my old 22′ ’90 ski nautique. $80 grand is still a lot of money.